from the anti-corrosive technology and the long term experience. Anti-corrosive pump with the ISO2858 standard dimensions. Back pull-out design with the spacer type coupling (near to API 610 design), and with the interchangeable dimensions to ISO2858 pump of any other source. 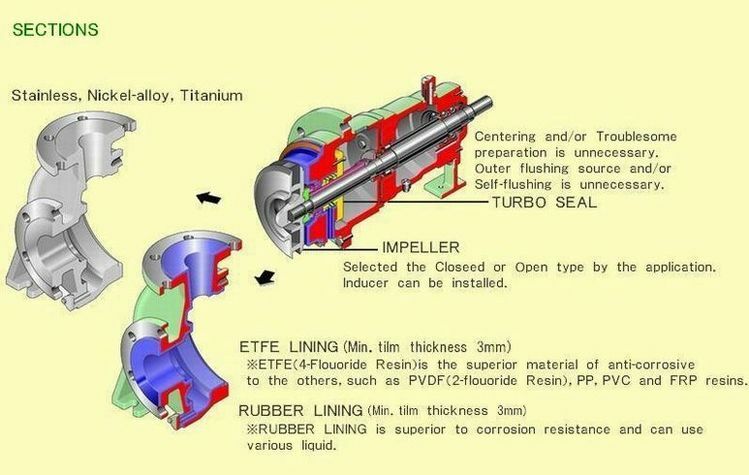 With the combination of ETFE or Rubber lined Casing plus special metal Impeller,such as Titanium,Alloy20, Hastelloy,the pump to be applicable to any kind of corrosive pumpage. Buck-pull-out construction can make easy overhauling possible,without removing the mainpiping and the motor. Chemical,Iron/steel plant,Planting plant,Decontamination plant,Fuber plant,Paper/Pulp plant.